It was in Paris, in 1983, that I fi rst met Abdul Rahman Ghassemlou. We were introduced at the Kurdish Institute, where I was attending an art exhibition with the fi lmmaker Yilmaz Guney and his wife, Fatosh. I had met Guney at the Cannes Film Festival in 1982. Th at year he had won the Golden Palm Award, and the publicity that followed brought worldwide attention to the plight of the Kurdish nation. As a Venezuelan journalist, my limited impression of the Kurds was that they were fierce warriors who lived amongst distant mountains somewhere in the Middle East. Yilmaz Guney taught me about the free-spirited Kurdish people, opening my eyes to the oppression they had endured for centuries. Their situation touched me deeply and I began to write articles on the Kurds for Venezuelan newspapers and magazines. One year later in Paris, I found myself standing face-to-face with this sophisticated, charming, and charismatic Middle Eastern leader of millions of Kurds in Iran. Ghassemlou's lifelong wish was that of lasting peace for his people. He was the visionary and cultivated leader of the Iranian Kurdish revolutionary movement, brutally assassinated in 1989 while negotiating a peace accord for his people with Iran's government emissaries in Vienna. His light still shines upon the volatile politics of this remote Middle East region that continues to play prominently upon the world's political stage. "Carol Prunhuber, writer and journalist, with links to the Kurdish world since the early 1980s, knew Dr. Ghassemlou and spent time in the Kurdish mountains with his guerrillas. 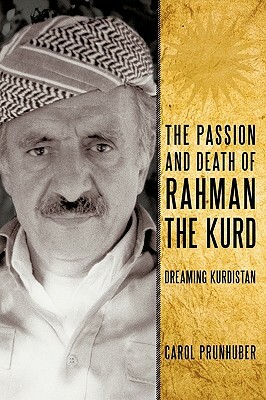 The Passion and Death of Rahman the Kurd is an impassioned and meticulously documented investigation that vividly evokes the enthralling life and final days of this incomparable Kurdish leader." -Kendal Nezan, president of the Kurdish Institute of Paris.